Horizon 2020 Information & Brokerage Event: Food Security, Sustainable Agriculture, Blue Growth and the Bioeconomy. Wednesday 26 September 2018, London, England. 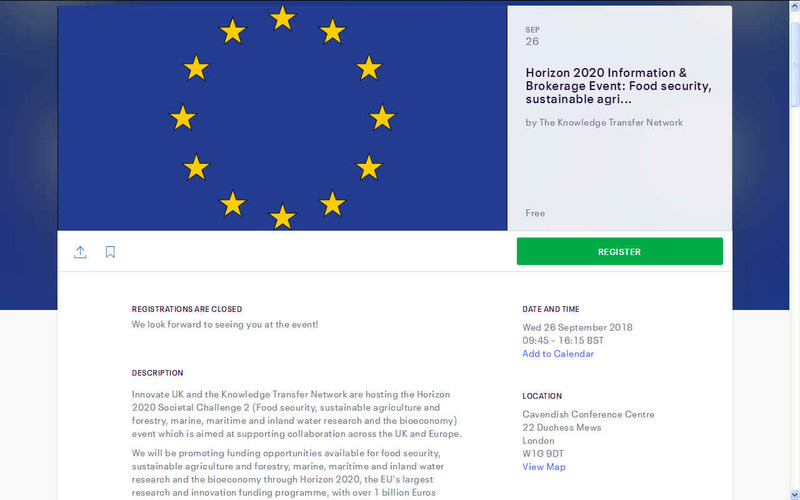 Innovate UK and the Knowledge Transfer Network are hosting the Horizon 2020 Societal Challenge 2 (Food security, sustainable agriculture and forestry, marine, maritime and inland water research and the bioeconomy) event which is aimed at supporting collaboration across the UK and Europe. We will be promoting funding opportunities available for food security, sustainable agriculture and forestry, marine, maritime and inland water research and the bioeconomy through Horizon 2020, the EU's largest research and innovation funding programme, with over 1 billion Euros earmarked for calls in 2018-2020. Hear from the European Commission and the UK National Contact Point (NCP) about the development of the Horizon 2020 2018-2020 work programme and the forthcoming 2019 call topics. Be inspired by success stories. Gather information about the proposal evaluation and guidance on dos and dont’s for proposal preparation. Informal networking during breaks staggered throughout the day. Book 1-to-1 meetings with other delegates including NCPs, KTN, EEN. Brokerage Activities - Pitch your project idea on stage and promote your profile on our networking walls. 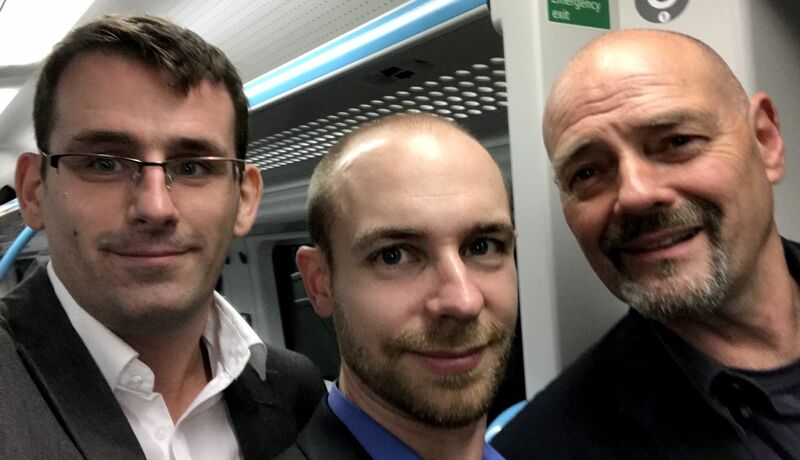 CHRIS, RICHARD & NELSON - The Three Musketeers returning home from a briefing event in London in October 2017 that the Cleaner Ocean Foundation did not qualify for, being a charity. In addition the funding rate would have been unsuited to a social challenge that is cleaning the ocean of micro and macro plastics. We live in hope the Whitehall wakes up to this particular problem before plastic outweighs fish in our oceans - estimated to be around 2050 at our present rate of dumping. There are people like the Ocean Musketeers who are willing to accept the ocean cleaning challenge if they are given the right level of support and will not lose anything other than their time in coming to the fore. 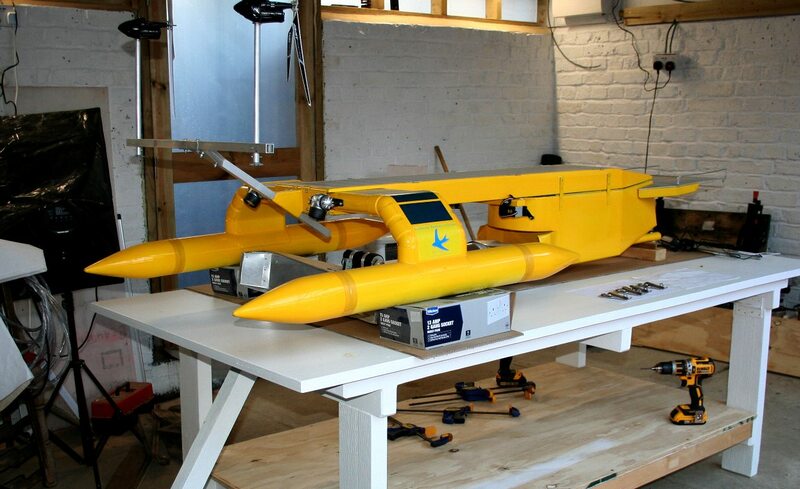 It appeared to us that SeaVax is at Technology Readiness Level (TRL) 3-5 where research is required before moving on to develop a SeaVax prototype at full scale in year six of the development programme. 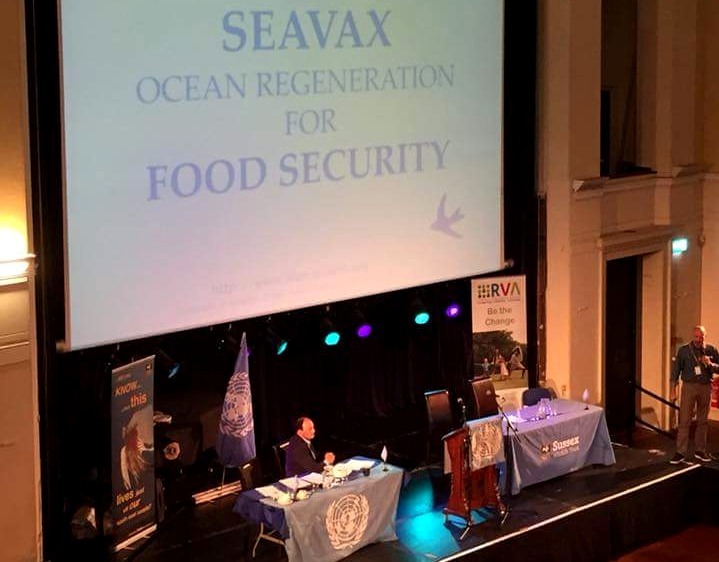 SeaVax may be considered under Sustainability Development Goal SDG2 where this is to ensure Zero Hunger. Innovate UK promote funding opportunities available for food security, sustainable agriculture and forestry, marine, maritime and inland water research and the bioeconomy through Horizon 2020, the EU’s largest research and innovation funding programme, with over 1 billion Euros earmarked for calls in 2018-2020. SEAVAX - Proof of concept model at 1/20th scale in the new robot laboratory, waiting for more outings in a test tank where experiments will continue into 2018 to define the best methods and most suitable machinery for filtering plastic waste from seawater. The results from this series of tests could be fed into a predictive application to further refine the concept to help development of the prototype vessel at quarter scale or even full size. OCEAN SYMPOSIUM - Nelson Kay presenting at the marine event in Hastings 22-10-18. The Knowledge Transfer Network is the UK’s innovation network. They aim to bring together business, entrepreneurs, academics and funders to develop new products, processes and services. By this means they might help you develop ideas, expertise and technologies, that have the potential to be world-beating products. Central to what they do is the initiation and building of collaborations designed to lever funding for new products, skirting around intellectual property rights that innovators relinquish in exchange for a percentage of funding.